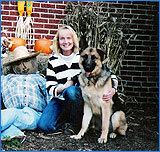 My name is Sabine Saunders and this is my 2 year old, female, German shepherd, Quincy. She was the only female in a litter of six pups and proved to be a domineering girl early on. I knew I had to do some quality training with her in order to keep my leader position in her eyes, or she would try to become the alpha in our family. By the time she was 8 months old, she had the strength of an adult German shepherd. Heeling had to be practiced every day in all kinds of different environments and among people and other animals - especially cats and squirrels. Through continuous practice Quincy now heels wherever I go, keeping a constant eye on me. Teaching her the sit and especially the down was very important to keep her with a submissive attitude. She fought it for a while but I consistently showed her that there are no options when I give her a command. After completing her basic obedience classes (heel, sit, stay, down, come) she also certified in tracking in 2005. Quincy and I enjoy visiting schools in our area and we show the kids and teachers how much Quincy has learned with English and German commands, and obeying handsignals. We teach the kids safety around dogs and what makes a good dog owner. Having an obedient dog is a joy to have around because the dog has learned how to behave in every day situations. Consistent obedience training is hard work, but if you endure with patience, love and an understanding of how dogs learn, you end up with the dog you deserve.